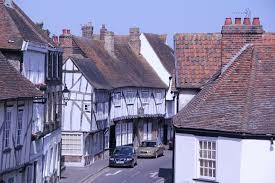 The Canterbury records show only two baptisms of John Frost before that of John junior in Sandwich. Both are from St Mary the Virgin, Dover. One is for John son of John ffrost on 15 April 1632, the other on 2 Feb 1633/4 also for John son of John ffrost. If either of these is correct that would make him 42-44 at the time of his marriage, which is unusually old. More probably his baptism is in another early register which is now lost or illegible. At the time of his marriage he is said to be of St Lawrence, Isle of Thanet. This parish is now part of Ramsgate at the NE tip of Kent. SUSANNA NEALE. It is highly likely that Susanna’s baptism was at St Mary the Virgin, Sandwich, on 15 April, 1647. She was the daughter of James Neale junior and Margaret Hindmarsh. married at St Peter, Sandwich, 1645. She was the eldest of eleven children, six of whom died in infancy. Two other brothers died in their twenties. The likelihood is that the family were living in poverty. We do not know her father’s occupation, but one of her brothers became a labourer before dying at the age of 22. The keeping of many parish registers was disrupted during the Commonwealth Interregnum of the 1640s to 1661 following the Civil War. Those of Sandwich survived. Kent was largely Royalist in the war. On 24 Jan 1668/9 John Brockman widower married Susannah Neale at St Peter’s, Sandwich. Susannah was 21. John Brockman had previously been married to Mary Menings on 29 April 1666 at St Clements, Sandwich. There were three sons from that marriage. Benjamin and Thomas 8 Nov 1668. We do not have a record of Mary’s burial, but the births cease after 1668. John Brockman and Susanna had another two children baptised at St Mary the Virgin. The following year John Brockman died. He was buried on 16 Oct 1671 at St Mary, Sandwich. Five years later, on 21 Jan 1676/7, Susanna married again. The wedding took place at St Mary the Virgin, Sandwich. John Frost of the parish of St Lawrence in the Isle of Thanet and Susana Brockman widdow married the 21st January. On the same day Susanna’s sister Margaret Neale married Jacob Chapman. Susanna’s stepsons, the twins Benjamin and Thomas, would then have been 8 years old, and her own children by John Brockman 7 and 6. We do not know whether the twins remained with her, or whether relatives from the Brockman family took charge of them. John Frost and Susanna went on to have six children baptised at St Mary. James 11 Jan 1679/80Susanna 9 Jul 1682. The following year Susanna’s stepson Thomas Brockman died, aged 15. He was buried on 23 Dec 1683. Their second son James was buried on 3 Feb 1687/8, aged 8. The following year, 1689, Margaret was baptised on 18 Aug, but lived only two months. She was buried on 31 Oct.
Next year, 1690, was disastrous for the family. First Susanna died and was buried at St Mary the Virgin, Sandwich, on 13 April, aged 43. Less than three weeks later, Elizabeth was buried on 30 April, aged 3. Finally, 7-year-old Susanna died. She was buried on 22 May. This was five years after the Great Plague of London. There were sporadic outbreaks around the country at this time. Or it may have been simply the effects of poverty, with malnourishment lowering their resistance to disease. Both of Susanna’s children by John Brockman seem to have survived, but only two of her six children by John Frost. John was still alive at the time of Susanna’s death. His burial has not been found.